We all know I love playing with different makeup and skincare products and lately I've been loving up on some new things. I still love my Josie Maran products, but here's another peek of what I'm putting on my face lately. 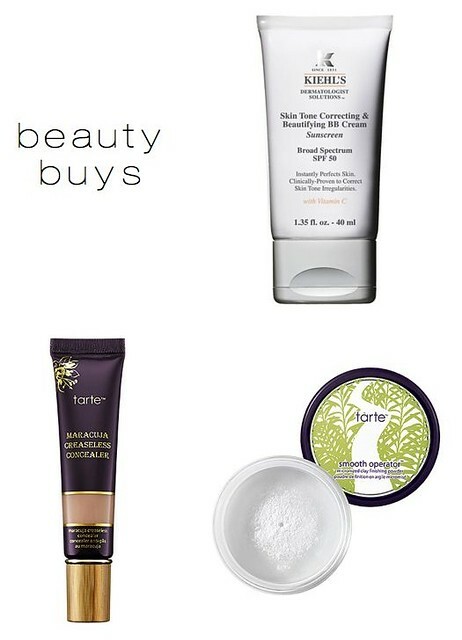 The BB cream is far superior to any that I've tried before. It's somewhere between a tinted moisturizer and a full-fledged foundation, but with the SPF 55 I feel so safe in the sun. I used to never wear concealer but I took a good look at my undereye circles the other day and realized I seriously need to do something. This Tarte concealer is amazing. A little really goes a long way, which means this tube is going to last me a good long while. And the best way to get everything looking amazing? A finishing powder, and Tarte's is just delightful. You go Tarte. Get on wit' yo bad self. Have you discovered anything good lately? Let a sistah know. My wallet is grateful for the fact that I rarely spend on beauty products (though maybe it would rather face instead of fashion?? ), but posts like this always tempt me!! That Tarte powder does sound loverly. It's the loveliest. Love it. LOVE tarte products! their blush tints/balm are amazing! That finishing powder is amazing- I just wish it was less expensive! i love JM products too! curious about that concealer..may need to try it next time. I've never used Kheils products but I will have to check it out! Kiehl's is amazing! I loveeeeee their stuff. It's perfect for sensitive skin. for me it's maybelline one by one amscara (in the pink tube). i have tested it against dior which was my go to for a decade (seriously), and the maybelline is better. very comparable, but overall it's just a bit better than dior. and 20 dollars cheaper. i recommend it to everyone.